This article was reported by the Globe Spotlight Team, reporters Scott Allen, Marcella Bombardieri, and Andrea Estes and editor Thomas Farragher. It was written by Allen. The state’s highest court, firmly embracing a special counsel’s conclusion that the state Probation Department is riddled with fraud and “systemic corruption,” ordered court officials yesterday to move swiftly to fire the probation commissioner, suspend his senior lieutenants, and ask prosecutors to weigh criminal charges. ”Such abuse and corruption are intolerable,” members of the Supreme Judicial Court said in a statement. The court’s sweeping move to reclaim the probation agency came after it unsealed damning findings by the independent counsel that the probation agency, led by Commissioner John J. O’Brien, “committed pervasive fraud against the Commonwealth” that went on for years and involved dozens of employees. The independent counsel, Paul F. Ware Jr., concluded that O’Brien and his senior executives oversaw a hiring system that was rigged “on a grand scale,” conducting thousands of phony job interviews when the positions had already been promised to politically connected candidates. Ware found that O’Brien had completely politicized the 2,000-employee department, giving jobs to candidates backed by state legislators while illegally pressuring employees to contribute to campaigns of key allies, such as state Representative Thomas M. Petrolati and state Treasurer Timothy P. Cahill. ”Corrective measures must now be taken to repair the damage wrought by the conduct laid bare by independent counsel’s investigation,” the SJC said. The court called for acting probation chief Ronald P. Corbett Jr. to identify the probation managers “most responsible for the reported abuses” and develop a plan for disciplinary actions by Dec. 1. The court created a task force led by former attorney general L. Scott Harshbarger to overhaul the hiring and promotion process. If O’Brien is fired, as appears likely, it will be a swift and stunning end to the 12-year tenure of this protege of former House speaker Thomas M. Finneran. O’Brien had long parlayed his political connections to boost his own budget and fend off challenges from judges, union leaders, and others offended by his secretive, autocratic style. Ware’s 307-page report lays out in extraordinary detail the way O’Brien weakened the agency he led as he knowingly hired and promoted inferior candidates - and, in one case, a convicted felon - to probation positions at the urging of key legislators. O’Brien, who declined to cooperate with Ware’s investigation, did not respond to requests for comment. In an interview with the Globe earlier this year, he defended his hiring practices as based on merit. The three deputy probation commissioners who were suspended with pay yesterday - Christopher J. Bulger, Elizabeth V. Tavares, and Francis M. Wall - declined to comment. Paul Grogan - president of the Boston Foundation, which released a report last winter highlighting the department’s explosive growth and mediocre performance - praised Ware’s work, saying his report had uncovered government wrongdoing on a scale not seen since the Ward Commission exposed corruption in public construction in 1980. ”We are very hopeful today’s report is a big step towards rebuilding a first-class Probation Department,” Grogan said. Ware, speaking to reporters at his Goodwin Procter law offices in Boston, said the Supreme Judicial Court responded appropriately to his findings. Ware said that while dozens of employees took part in the politicization of the department, he identified only six senior managers as likely targets for criminal investigation. In addition to O’Brien and his three suspended deputies, Ware said that two retired deputies, William H. Burke III and Patricia Walsh, may have committed state and federal crimes that could include fraud, bribery, conflict of interest, and illegal solicitation of campaign contributions from probation employees. Ware also said that Tavares and Bulger, both lawyers, should be referred to the Board of Bar Overseers for possible disbarment. Ware, in his investigation, also pursued the Spotlight finding that the Probation Department was beset with a “pay to play mentality” in which scores of job seekers made contributions to legislators in apparent hope of favored treatment. Ware said he could not prove that individual politicians got jobs for people directly in exchange for campaign contributions, which could violate state and federal bribery statutes. Specifically, in two cases identified by the Spotlight report as possible instances of “pay to play,” Ware said he could not substantiate that the probation officers’ donations to politicians played a meaningful role in their promotions. But Ware said statistical evidence strongly suggests that legislators tried much harder to get jobs for people who gave them campaign contributions. Ware said his job was to investigate problems in probation, leaving it to others to probe whether legislators broke the law, too. The report, based on the testimony of nearly 100 witnesses and the review of 525,000 documents, including internal e-mails and computer hard drives, paints a stark portrait of corruption that has flourished since O’Brien was named commissioner. The report suggests that ethical standards slipped so far that O’Brien himself was soliciting political contributions for key legislators such as Petrolati, the House speaker pro tem, in a state office building cafeteria, which would be a violation of state law. O’Brien also urged employees to donate money to Cahill in 2005 just when O’Brien’s wife was under consideration for a job under Cahill. Laurie O’Brien got the job shortly after probation employees gave $4,000 to Cahill. O’Brien’s fund-raising for Cahill “was an apparent violation of the law and an abuse of O’Brien’s authority,” Ware concluded. The special counsel makes it clear that O’Brien was supporting legislators’ job candidates in exchange for a bigger probation budget. O’Brien’s political aides methodically kept track of legislators’ favored candidates for jobs, showing that legislative leaders received by far the most patronage hires, Ware found. O’Brien had a separate spreadsheet to keep track of the candidates of Salvatore F. DiMasi, the former House speaker, the special counsel reported. ”Generous appropriations for the Probation Department were linked to O’Brien’s willingness to systematize fraudulent hiring and promotion on a pervasive scale,” wrote Ware, pointing out that the Legislature gave probation $25.4 million more than the Trial Court requested between 2006 and 2009. O’Brien, who was suspended with pay the day after the Globe Spotlight story in May, initially told Ware that he would fully cooperate with the investigation, and in his only interview with the Globe, he forcefully defended his hiring practices. “We select the most qualified individuals to carry out the responsibilities in a professional and competent manner,” O’Brien insisted. Finneran and Petrolati also declined to answer questions under oath about their role in probation hiring, citing their constitutional rights. Finneran was the key architect of a 2001 law change that consolidated most hiring and firing power in O’Brien, his one-time Dorchester neighbor and former jogging partner. Finneran resigned in 2004 in the face of perjury charges and later pleaded guilty to obstruction of justice in a legislative redistricting case. Petrolati, known to some colleagues as “the king of patronage” for his influence over Probation Department hiring in Western Massachusetts, had unsuccessfully appealed to the Supreme Judicial Court to avoid testifying before Ware, asserting that Ware had no authority to question legislators. In the end, Petrolati was compelled to testify, but he and his wife, Kathleen, an $88,058-a-year department manager, declined to answer Ware’s questions. 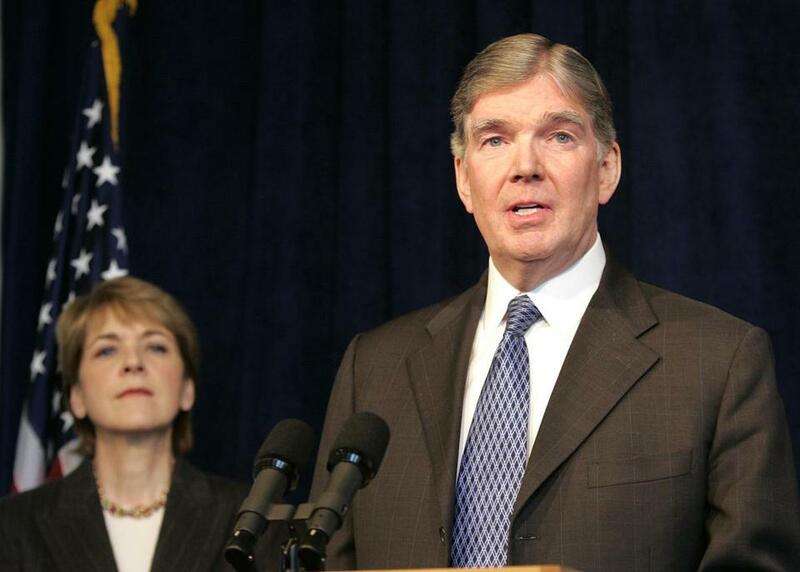 Ware presents evidence that O’Brien’s leadership was compromised from the start, noting that the chief judge who appointed him in 1997, the late John J. Irwin Jr., apparently lowered the educational standards so that O’Brien, who graduated from Boston College with a bachelor’s degree, would qualify. Shortly after he took office, O’Brien hired two of Irwin’s relatives, one of whom, Eugene Irwin, also declined to answer questions from Ware’s investigators. The two judges who succeeded Irwin as the court’s chief justice for administration and management battled with O’Brien over his hiring practices, while O’Brien fought to limit the court’s involvement. Judge Robert A. Mulligan, who now holds that job, in 2005 accused O’Brien of scheduling a staggering number of interviews - 3,800 for a total of 52 positions - so that judges would not have time enough to play a meaningful role in vetting applicants. ”I can only conclude that you have decided on 3,800 interviews so that ... judges would not want to be involved,” Mulligan wrote to O’Brien, in a letter cited in Ware’s report. Likewise, the union that represents probation officers lost virtually every challenge they made to what they perceived as politically motivated hiring because, Ware said, O’Brien’s procedures looked impeccably fair on paper. That impression, Ware said, was an illusion. And it may have been fostered by repeated perjury by O’Brien’s supervisors in arbitration proceedings. Ware said that, in 38 grievance cases he reviewed, probation managers never acknowledged to the arbitrator that O’Brien sent lists of preferred candidates for job openings. O’Brien’s lists of preferred candidates, often delivered on yellow Post-it notes, were not mere suggestions. Numerous probation managers said they felt compelled to support O’Brien’s picks unless, as Burke, the retired deputy commissioner, told Ware, they were “really really, and I mean really bad.” Otherwise, several testified to Ware, they feared they would be punished. Regional supervisor Ellen Slaney said O’Brien became “physically upset” with her when she rejected the son of former state senator William “Biff” MacLean for a probation job because the younger MacLean was a convicted felon. O’Brien himself had originally opposed hiring Doug MacLean, too, but he told MacLean’s supervisor that he was getting pressure from the Legislature to relent. Eventually, he hired MacLean anyway and placed Slaney in a sort of professional exile, transferring her from a job near her home in Southeastern Massachusetts to a posting in Western Massachusetts. Edward Dalton, a retired supervisor, told Ware he was reassigned from doing interviews when he tried to block one of O’Brien’s favored candidates. Dalton even received an ominous voice mail from the department’s personnel director, Janet Mucci, which he preserved and gave to the independent counsel. ”If people are uncomfortable with this [rigged interview process], he’s going to have to remove people from doing interviews,” Mucci said on the tape. In addition, he said the current legal counsel to the department, Bulger, the son of former Senate president William M. Bulger, was dishonest in his testimony and had “irrevocably compromised” his credibility by continuing to advise O’Brien after his suspension. Bulger admitted he talked to the suspended commissioner several times a week. Ware said their legal failings may have opened the Probation Department to legal liability from some of the job candidates who were passed over in favor of the politically connected. But he said it was probably too late for the Probation Department to remove employees who got jobs because of connections instead of ability, because of state personnel and union rules. Ware found that O’Brien’s patronage machine was so extensive that some legislators rated their people on a scale of one to four, often giving the highest rating to people who were also campaign contributors. On one “sponsor list” compiled for O’Brien, Ware found that 62 percent of the legislator-backed candidates got probation jobs, if they also gave money. But only 25 percent of sponsored candidates who did not give money got probation jobs. Ware’s report, ultimately, focuses on the Probation Department, leaving many unanswered questions about which legislators were most responsible for boosting the department’s budget and whether they were explicitly trading state money for jobs. However, Ware’s conclusion about O’Brien himself is unambiguous.